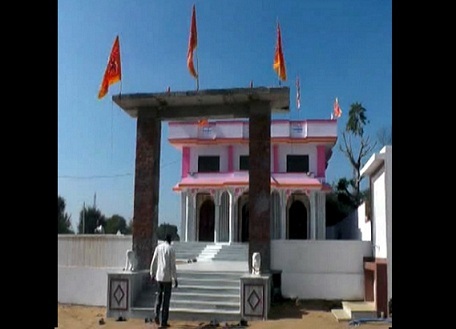 In another example of communal harmony, Muslims in a Rajasthan village gave away over 1.5 bigha land for a temple. This has appened in Kolida, a village, near Sikar town. The chunk of land was gifted to Hindu community for temple construction project. The deputy sapranch, Mohammad Ishaq, came to know that the Hindu community that was planning extension of temple and didn't have land availabale in the vicinity. Ishaq told other members of the Muslim community in the village about it. Everyone agreed and it was unanimously decided that the part of the chunk of land that belongs to the graveyard would be gifted to the Hindu community for the project. The temple was adjoining the graveyard land in the same village. Initially, it was a small temple. Later, the villagers began construction and the extension required more land. The Hindu community has thanked Muslims for the gesture. There have been incidents in the past when people have given away land to other community. Earlier too Hindus have donated land for construction of mosque or for grave yard, and Muslims have also donated land for temple construction. However, the difference is that in Kolida [Rajasthan], it was not a person's individual decision. It was community decision and it was land of the local Musslims. They felt that their Hindu brethren needed land and it was the right thing to do. 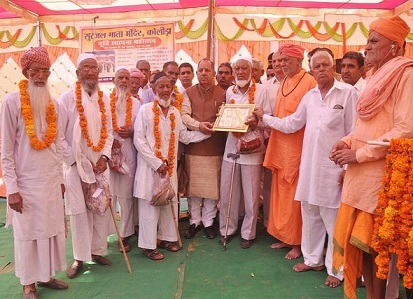 Overwhelmed, the members of the Hindu community in the town, have thanked and felicitated Muslims for their decision. See photo below. 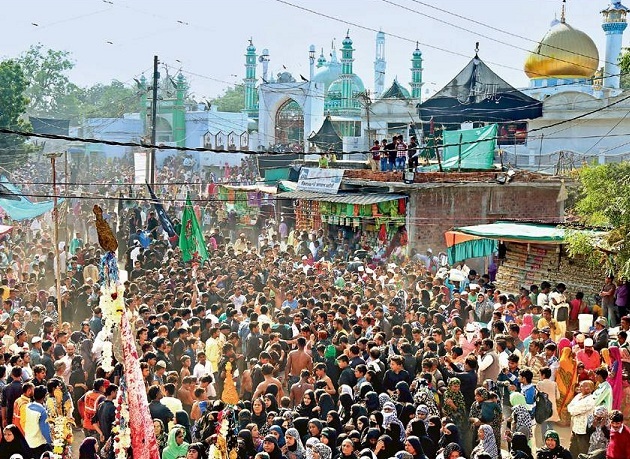 Every year lakhs gather at Husain Tekri, the famous shrine in Jaora in central India, forty days after Ashura. 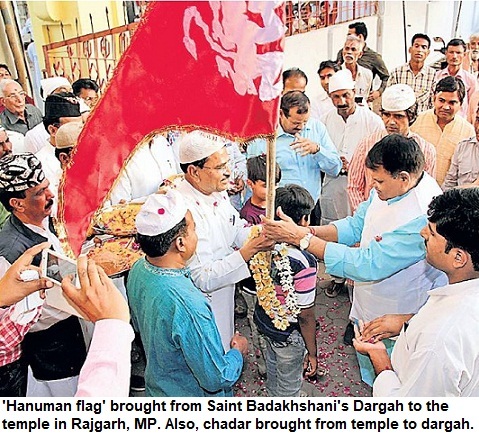 This year too, devotees from all over India, including Shias, Sunnis and also members of other communities reached Jaora town in Ratlam district of Madhya Pradesh. It is one of the biggest gatherings on Chahallum anywhere in the sub-continent. Hundreds of thousands take part in the rituals every year [40 days after the tenth of Islamic month of Muharram]. Lakhs attend the Chahallum rituals in this town every year. People come from as far as Kashmir and from Deccan, from Uttar Pradesh and Bengal, and even from other countries. The photos are taken by Mustafa Vilayati. This 19th century shrine was built during the reign of former Nawabs of Jaora, a princely state in British India. Over the years, it has emerged as a major town for Shias in India, because of the scale of the Muharram and Chehallum rituals. While Arbaeen in Middle East draws attention, this huge gathering in a small town in India generally fails to make it to the headlines. For more information about the rituals, read a post on this blog published last year. 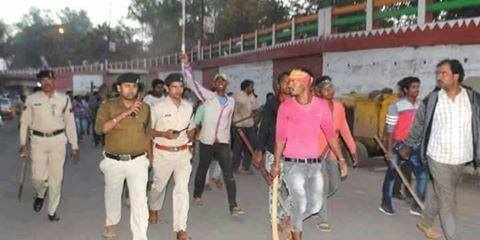 The rioting in Vidisha has been controlled. Curfew has been relaxed and the situation is getting back to normalcy. After arson, violence and hooliganism, peace has returned to the town. But these pictures will haunt the administration and citizens for long. A row escalated because the police didn't take prompt action, say citizens. Later, a person was killed due to the conflict. The person belonged to Bajrang Dal. Those accused of murder were arrested. The arrests were necessary and were made promptly. However, soon the Bajrang Dal cadre took to streets in the city, which sends none other than Minister of External Affairs Sushma Swaraj to Parliament. From evening violence begins. People run with patients from hospital. There is arson. 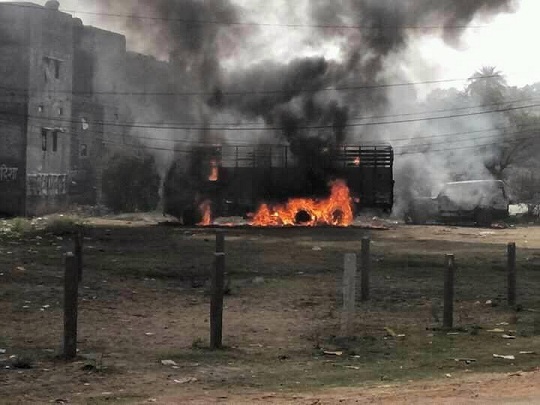 Vehicles, shops are set on fire. Houses were attacked. People were injured but fortunately no fatality. Yet police remains mute spectator. The next day, violence escalates. The rioters are on the streets. But police turn askance, not even acting against them or even asking them to go away. How can rioters get so emboldened? Had the images not been splashed in local media and a strong police force not rushed to Vidisha, the situation may not have been controlled. Vidisha was represented by former PM Atal Bihari Vajpayee in the past. 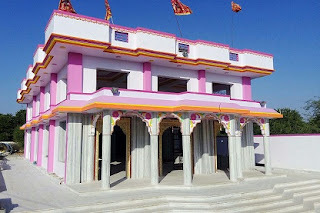 MP chief minister Shivraj Singh Chouhan won election from here, repeatedly. It became his home constituency. Hence, Vidisha has a special place in MP politics. Yet, the shoddy manner in which police acted, leaves many questions. Mercifully, the riot didn't spread and the violence stopped. and the administration learnt anything from the riot? The photographs published in local newspapers, questioning the role of police when the mob was on the streets, must lead to serious introspection. See caption in photo on the left. It was published in local newspaper, which said that police turned away its face when rioters were on the streets. The picture was taken at Ramlila Road. 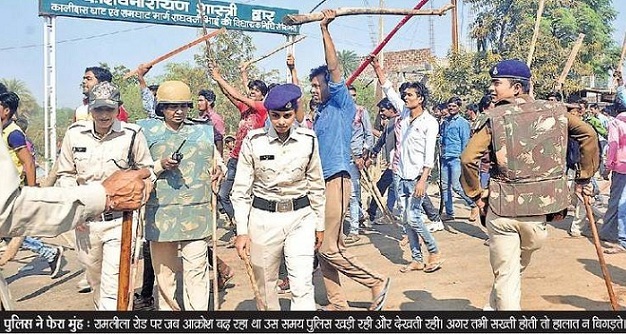 "If only police had been a little more stern, situation won't have worsened", caption reads. The other photograph on the right shows rioters walking with the police. 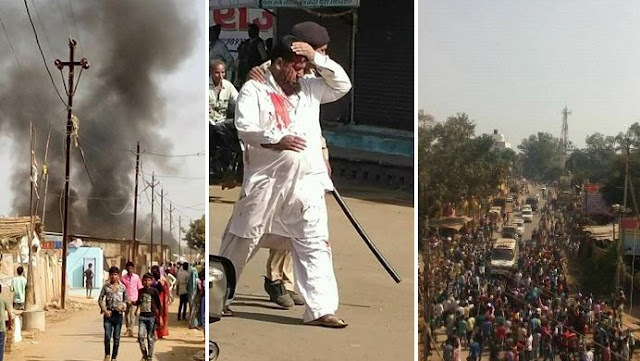 After the suspensions of top officials in Betul and Jhabua, is the police reluctant to act against right-wing activists? The State government's entire security establishment--Police Headquarters and Home department, need to send a strong message. If policemen are under pressure and scared of taking action, it is a potentially dangerous situation. Nehru passed away over fifty years ago. A Kashmiri Pandit whose family had settled in UP, Nehru was indeed a charismatic personality. Generations of kids grew up on the story of 'Chacha Nehru'. But Nehruvian India underwent major changes in the last few decades. In recent years, there have been growing voices against Nehru's vision, policies and his 'Westernised' outlook. Though attempts to malign his personality have been going on for decades. And, doesn't it sound bad calling Nehru, a Kashmiri Pandit leader, bringing his stature down! But if Sheikh Abdullah was Kashmiri Muslim leader, and when Nehru is attacked so much, can we take this liberty for a while? India's first PM belonged to the KP community, which indeed suffered and had to leave its homeland after militancy began. But it is not felt required to mention that Nehru [and many other leaders of freedom movement--Saprus, Katjus, Kauls], belonged to this community. And, whether we like it or not, whether it suits our political positions or not, truth is that Nehru's stature and following among the Indian masses, at the time of independence was far ahead of any other leader. Ram Rajya Parishad, Hindu Mahasabha and Jana Sangh didn't have public support then. When abusing, targeting and engaging in character assassination of Nehru, by floating 'stories' about his life or morphing photographs has become a fashion, this fact too needs to be stressed upon. They were all committed to values of secularism--something which is anathema to Nehru-baiters. They feel India could have been a Hindu nation, long back, had Nehru not been at the helm for all those years. Nehru is credited for establishing major institutions. Critics, of course, feel that he was more an idealist and romantic leader, rather than a pragmatic politician. They blame him for a lot--from partition to the Kashmir problem, from our slow progress to the Chinese invasion. They are entitled to their views. We must listen to each other and agree to disagree. Nehru was and will always remain our first PM. You can't erase this piece of history. On Children's Day, the enthusiasm has been slightly less in recent years. Reasons are obvious. However, in schools [many private schools] there were celebrations. The statues were garlanded. 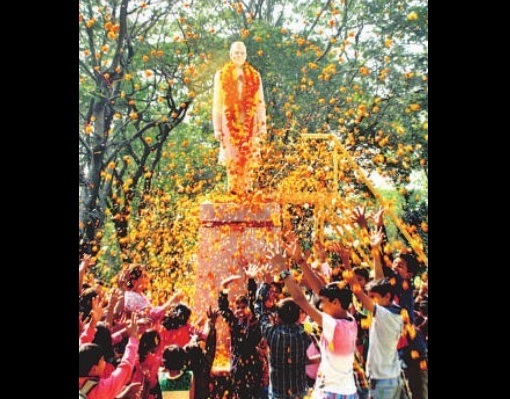 This is a photograph of flowers raining on Nehru statue in Madhya Pradesh. It has taken 227 years. America has seen 43 presidents in history. But not a single woman head of state, till now. In a few hours*, results would be known and we will know if United States of America (USA) is going to have its first woman Prez. Initial trends suggest Donald Trump is ahead, though Hillary Clinton is still in the race. But, compared to the 'progressive' USA, States in other parts of the world have elected many women head of states including Presidents or Prime Ministers. Today, Europe has Chancellor Angela Merkel in Germany and Theresa May in Britain. However, in Asian countries--Hindu and Muslim nations, there is a long history of popular women leaders who led their countries. Srimavo Bhandarayaka was the former Prime Minister of Sri Lanka [Ceylone]. Indira Gandhi was, of course, Prime Minister of India, for so long. Benazir Bhutto, the former PM of Pakistan, was a charismatic leader. Tansu Ciller was Prime Minister of Turkey. 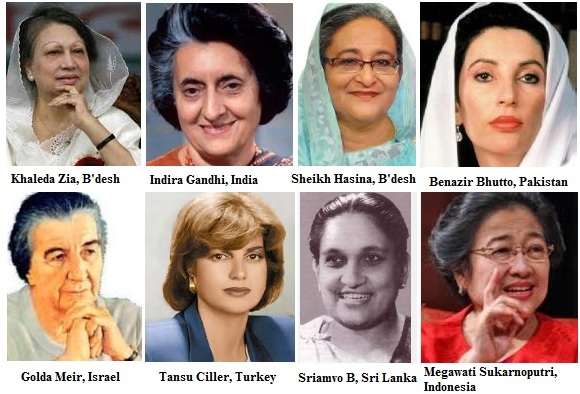 Bangladesh has the best record of electing female leaders. The contest has been between Sheikh Hasina Wajid and Begum Khaleda Zia. Both of them have been PMs in the country. Among the initial women leaders was Golda Meir, the former PM of Israel. One of the most well-known women politicians to lead a country was Margaret Thatcher in UK. There have been many more names. It is surprising that America hasn't had woman president before or even a serious contender. This is surprising because countries where women empowerment is believed to be far less and where literacy among females is quite less, have had female leaders. *This post was written before the polling. Donald Trump has now been elected President. Once again, America hasn't chosen a woman to head the country. 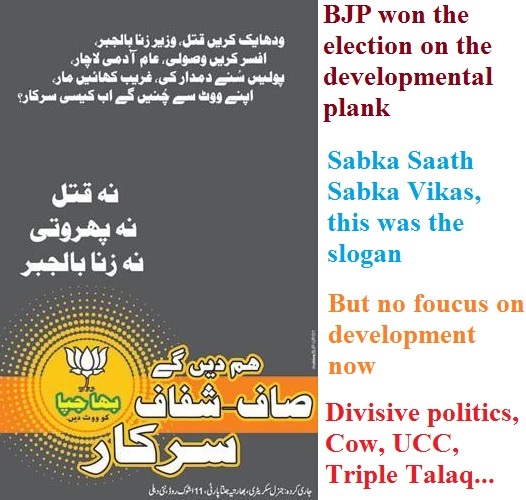 BJP won election on development plank but doesn't know anything except divisive politics! The BJP came to power on the development plank. It had fought the Lok Sabha election, claiming that its slogan was, 'Sabka sath, Sabka vikas'. It meant that the party had claimed voters' support for an inclusive growth and developmental model. But, as soon as it came to power, it steadily got back to divisive politics. You may claim otherwise but it seems that the BJP can't do without raising issues that divide society. Issues BJP govt likes, wants you to discuss--Pakistan, Triple Talaq, Uniform Civil Code, Cow, Muslims, Army, Communalism et al. On TV channels, 90% debates will be on these subjects. Issues that irk BJP and it doesn't want focus on them include--Inflation, Illiteracy, Corruption, Unemployment, Farmers suicides, poor state of health education, casteism, crimes against Dalits ands other backward sections, etc. Channels won't talk about them. In fact, he suggests that TV channels are also part of the game: one group takes 'secular' position, the other takes 'non-secular' position, which not just divide society but shift focus from the real issues. It seems that BJP is yet to learn that it is not just a political party but that it wins elections in states and at the Centre, and it needs to govern, to administer, to run the country. Call me a critic. Yes, I am not a BJP fan. But why is your focus not on development. You lose Delhi and you go after Arvind Kejriwal and his party, in such a cheap manner that doesn't behove a national party. Every few months there would be a state election and the strategy to win poll is nothing but to 'divide' voter. Hence, development is left behind somewhere. Barely two more years you have. You hope to polarise, divide and exploit patritotic feelings to win again in 2019. But, be realistic. Ask yourself, what have you done on developmental front. Where is inclusive development? If only the focus was right, you could have won admirers from the opposite camp also. But it seems that you are yet to learn any other method--apart from communal divisions an controversial issues, to stay afloat in politics. 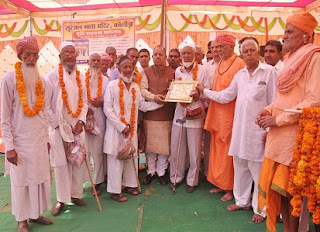 Pakistani Muslim leaders participate in Hindus' religious celebrations: Will you call it 'Hindu appeasement' in Pakistan? Now, would you call it 'Hindu appeasement' in Pakistan? The leader of Pakistan People's Party (PPP) performs Hindu rituals while participating in Diwali celebrations of Hindu community. The man is Bilawal Bhutto Zardari, who is the chief of Pakistan People's Party (PPP). He, along with other PPP leaders [Sherry Rahman is also visible], took part in Hindu community's religious events in Sindh. During Diwali celebrations, there was puja and other religious rituals including offering the scared water to sivalinga. Zardari participatd in it. 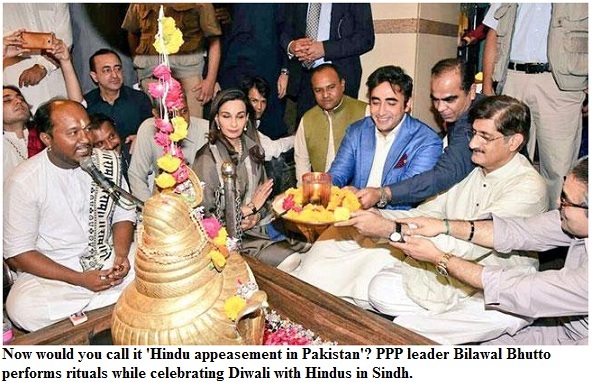 Not just PPP, other parties including Muslim League also takes part in the Hindu religious celebrations in Pakistan. In Pakistan, Hindus are not a big minority. Their votes don't matter too much. But across the world, leaders take care of minorities too. In India, we see outrage when a Hindu leader attends an 'iftaar' or wears a 'topi' [skullcap]. All these are courtesies and part of sharing culture when we live together. Indian Muslims or no Muslim would ask a Hindu to perform the Islamic rituals like Namaz or Roza. Indian Hindu leaders also won't expect Muslims to perform any Hindu rituals like puja or aarti. But there are certain common points. You go and meet each other, wish the minorities. You also take part in their festivals and it depends, if you like, you can even take part in their celebrations and rituals. One must be a human first. However, when hate consumes mind, people ignore logic and civilities. There are just charges, counter-charges and fail to even appreciate that others can also be liberal or accommodating. That's what bigotry is all about. However, it is important that we realise that truth is not what we see through channels. On the ground, people are still much more humane, accommodating, close to each other and take part in each others' festivities. 1. Politicians' iftaar angers right-wingers: Is there a world beyond the word 'appeasement' in India? Role of a section of Hindi media in turning 'aaropi' [suspect or accused] into 'criminal' or 'terrorist' even before completion of trial and judgment, is something that has affected a large number of under-trials. If someone is guilty of crime or terrorism, stern action is definitely needed. The person must be booked under harsh laws and all evidences should be gathered to get him convicted. But, if you term someone 'aatanki' or 'apradhi' i.e. 'terrorist' or 'criminal', even before the trial has been completed--it makes a mockery of justice and the entire system. Sadly, this has been happening in India for years now. In North India and Central India, the situation is even more acute. Certain newspapers [more than TV channels] are involved in this dirty practice. In central India, Dainik Bhaskar leads this trend. The law of the land says that a person is innocent till held guilty by the courts. However, Dainik Bhaskar seems to have a right to call anyone terrorist even before trial is over. So police says, 'accused' but the paper terms it 'terrorist', which affects investigation. Aseemanand or Sandeep Dange may be accused in cases of bomb blasts but are not termed 'aatanki'. But the same newspaper terms even those Muslim youths 'aatanki, who face no blast or terror charge. Just if there is accusation of association with a banned outfit, the Muslim youth is promptly termed 'aatanki'. This is not the word police use after arrest. But newspaper creates scare and brands arrestd person. Anyone who is involved in unlawful activities and association with banned outfits is booked under Unlawful Activities Prevention Act (UAPA). It is registered against suspected Maoists, suspected ULFA cadre and those with suspected SIMI [Islamist] links, right-wing [Hindutva] groups. There are dozens of organisations banned in India. Apart from them, members of outfits that are not banned are booked under the law. Many of them are not members of any outlawed groups but are caught for explosion, blasts or other terror-related acts. None of them is termed 'aatanki'. However, among most newspapers, Dainik Bhaskar seems to have the 'power', an extra-constitutional power to name anyone 'terrorist' as per its discretion. When someone is judged a criminal or terrorist, it leads to entire society turning away from the person's family. It affects court cases and also entire life. Families are destroyed because of irresponsible reporting. It is unfortunate that there has not been a serious action against newspapers that act as courts and assume the role of judges.